Captain Connell became a member of the Newark Division of Police in July of 1990 and has over 25 years of experience in law enforcement. 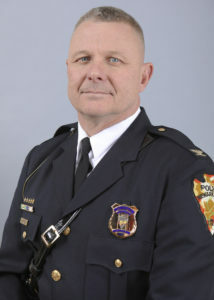 He was promoted to Sergeant in June of 1998 and Captain in August of 2010. On March 6, 2015 Captain Connell was sworn in as Acting Chief. In a ceremony on June 1, 2015 Acting Chief, Captain Barry Connell was sworn in as the new chief of the Newark Division of Police.